Jacques Guerlain was said to have been influenced by the blues used by Impressionist painters. The blue hour also refers to dusk, when flowers smell their sweetest. Having been composed two years before the outbreak of WWI, L'Heure Bleue also evokes a pre-war, romantic Paris, before darkness descended upon the city. Sweet, spicy, and soft, with a warm base that evokes leather, the perfume suspends a host of intense and suggestive scents in an uneasy but beautiful balance, just as the blue hour of the perfume's name holds together, in a melancholy moment, the waning of day's hopes and the beginning of night's uncertainty. The almost confectionary sweetness of the perfume is balanced by the spice and sharpness of bergamot, clary sage, tarragon, and a very prominent clove bud note. perfume that I could never imagine myself wearing. I would feel oppressed by a fragrance that didn't let me reinvent it on myself. Like a ghost that haunts a house so that living in it is impossible for new inhabitants, L'Heure Bleue imposes on its wearer its melancholy story about a beautiful time right before much was lost. To answer the ad's question: I am not her type. And she, alas, is not mine. If you are black, you will recognize the scent as that of Blue Magic hair pomade (grease). and mustard gas clearly changed that new century and time into a reality that was less kind, less romantic, and less beautiful in all respects. 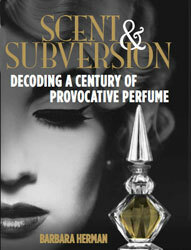 perfume and what it accomplishes! Thanks for your lovely thoughts on L'Heure Bleue, Jonathan! I love this scent (as do my teenage and pre-teen daughters) mainly because for me it evokes the scent of violets, which I adore. Yet, the five foot one, 95 pound person that I am feels like an imposter whenever I wear this fragrance for I imagine someone voluptuous and more "womanly" wearing this scent! Given that I have never been one to apologize for my perfume choices (when my peers were dousing themselves with Love's Baby Soft in junior high the then 65 pound scrawny person that I was in the mid 70's was wearing Channel 22, Crystalle, Chanel 19, Aliage, Private Collection, Oscar de la Renta, Rive Gauche among many other more mature fragrances)this comes as a surprise to me. Despite the fact that I feel a "lack of entitlement" I wear L'Heure Bleue from time to time just because I love it! I resurrected my "empty" bottle of L'heure Bleue from my basement because there is still a tiny bit left in the bottle. My girls and I have been smelling the cap and I have been spraying it on my wrists sparingly for about a week now (and huffing away!!). Despite the fact that my mind is telling me that I should not love this fragrance so much I truly do and am tempted to buy another bottle (my husband will kill me!!!). However, I am also intrigued by the reviews I have been reading on one of the websites you introduced me to about Mitsouko, which I have yet to sample. What do you think, L'Heure Bleue or Mitsouko? Last night my daughter was "huffing" away at the bottle cap of L'HB when she said to me, "You know this is such an odd fragrance. It kind of reminds me of urine, yet I like it!" Out of the mouths of babes!Now I know what Barbara means by dirty, animalistic scents, althogh there is no mention of civet in L'HB. I wonder what ingredient is making my daughter sense it this way when I, on the other hand, sense violets? Funny about L'HB - I like it, I don't love it. And that's parfum; I think the EdT is hideous. Interesting to smell, yes. Better in summer, yes, when the anise and clove can contend with all that sweet ambery stuff. In the winter, this thing is all almond pastry on me, no bones whatsoever. Mals, I guess by girly I mean too-feminine. L'Heure Bleue is too sweet for me, too confectionary. I've worn this for forty years now, and the other day my radiologist actually begged me to tell him what it was, as he said he's come to identify it with me year after year of exams. He's a "nose" as it turns out and it was driving him nuts. After trying about thirty other perfumes on and off, I always come home to this. Sometimes it smells of root beer or Play Doh, but most of the time, just the perfect perfume of my entire life. At times, I change over to Chamade, Shalimar, Vol De Nuit or even the very soapy EdC of Apres l"Ondee recently released by Guerlain in a fling of nostalgia, so I guess I just like the famous Guerlinade base but then it's back to L'Heure Bleue. Your description of L'Heure Bleue as a comb of rootbeer and playdough are making me want to pull it out and sniff it again, inkstain! I can appreciate this one, but it's too melancholy for me to wear. Id love to smell it on someone for whom it worked, though. 40 years without being sick of it; that's something else!